I originally posted this photo and brief blog entry on July 28, 2008. For this re-post, I’m including the ensuing grammar lesson that resulted from this harmless little photo of some homegrown tomatoes. I just picked these little jewels from the garden this afternoon. As I was carrying them inside, I thought…hmmm…two yellow ones…they look like big orbs…with eyes! 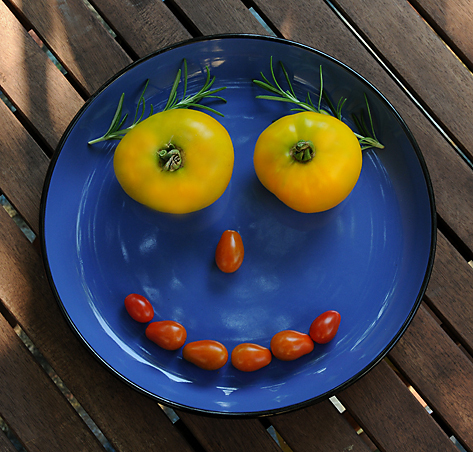 And I have just enough new cherry tomatoes to form…a smile….oh, and what looks great with bright golden yellow and orange-red? Cornflower-french blue! Oh, and what about rosemary eyebrows? While I realize the concept of playing with your food (and photographing it) isn’t a new concept, I felt (creatively) compelled to do it anyway. So…voila! I present to you—‘Mater Melvin. How can this colorful little concoction not make you smile? Step away from your desk and go grow something! She was followed by my father (aka “The King of Texas”): MATER: — noun — an informal use of the Latin word for mother, sometimes used by British schoolboys or used facetiously. Also refers to a female parent, a mother—a woman who has given birth to a child (also used as a term of address to your mother). I submit this only to point out that Melvin may feel compromised by the application of the term “mater.” Perhaps the graphic might better be termed “‘mater Melva.” I fully realize that in this case, as in so many others, I am “neet peeking” but I can’t resist it—it’s in my nature! And here is my response: And now, my dearest friends, you can finally understand why I am so compelled to correct (some of) you when you misuse “lie” vs. “lay.” I explain that a “dove” is a bird and not something you do off a diving board. I correct you when you use “I” vs. “me” at the end of a sentence. I lecture that “irregardless” is crude and unacceptable in most circles (i.e. mine). The word is “regardless.” I insist that you put the periods and commas inside the quotation marks. I preach when to use “further” vs. “farther.” I cringe when you use “its” in the possessive form when you mean to use it as a contraction (or vice versa). You can just imagine how I must feel when someone misuses “lose” vs. “loose” when they are writing. I can’t help it. I am my father’s daughter. The apple never fell from the tree. Oh, and for the record, Grammar Guru says one should always avoid using exclamation points. He says using one in a sentence is like laughing at your own joke. (I ask him why God made exclamation points in the first place if he didn’t want us to use them. He has no answer for that one.) I break with tradition here and must admit that I have been known to use one when I’m truly excited (on paper). However, I do think using two is a tad much (I’m sure you’ll agree). And three? Egads!!! The old school conjugation of “to dive” (a la McGuffey’s Reader), present, past and future—is dive, dived and dived (I dive today, I dived yesterday, and by this time tomorrow I will have dived again). Virtually every source, including the college edition of The American Heritage Dictionary, shows “dove” and “dived” as acceptable past tenses of the verb “to dive.” Many people choose “dove” over “dived,” one syllable rather than two, notably in cold northern regions (we in more tolerable climates speak a bit slower and prefer two syllables). We have, over time, perhaps corrupted the past tense of the verb “to dive” because of its similarity to other verbs such as drive (drive, drove, driven) and strive (strive, strove, striven). However, its inclusion in the dictionary doesn’t make it right—one also finds a four-letter synonym (verb, noun, etc.) for excrement in the dictionary, but the term is not used by literate persons—at least not in polite conversation (not even in the colder regions). It’s available to all, of course, but its indiscriminate use immediately labels the speaker. Either dove or dived is acceptable as the past tense of dive. Usage preferences show regional distribution, although both forms are heard throughout the United States. According to the Dictionary of American Regional English, in the North, dove is more prevalent; in the South Midland, dived. Dived is actually the earlier form, and the emergence of dove may appear ANOMALOUS (please note the definition below) in light of the general tendencies of change in English verb forms. 1: inconsistent with or deviating from what is usual, normal, or expected : irregular, unusual. 2: of uncertain nature or classification b: marked by incongruity or contradiction. The use of “dove” as a past tense of dive, according to Merriam-Webser, is therefore inconsistent, deviating, unusual, abnormal, unexpected, irregular, uncertain, incongruous and contradictory. Given all those negatives, I can’t imagine why anyone would use, or even think of using “dove” in that manner. Let’s face it—it’s a bird! Old English had two classes of verbs: strong verbs, whose past tense was indicated by a change in their vowel (a process that survives in such present-day English verbs as drive/drove or fling/flung); and weak verbs, whose past was formed with a suffix related to -ed in Modern English (as in present-day English live/lived and move/moved). Since the Old English period, many verbs have changed from the strong pattern to the weak one; for example, the past tense of step, formerly stop, became stepped. Over the years, in fact, the weak pattern has become so prevalent that we use the term regular to refer to verbs that form their past tense by suffixation of -ed. However, there have occasionally been changes in the other direction: the past tense of wear, now wore, was once werede, and that of spit, now spat, was once spitede. The development of dove is an additional example of the small group of verbs that have swum against the historical tide. Yes, I know—I have a lot of time on my hands. Then my friend Jeff tops it off with this humorous response: Oh. My. God. Oh wait, I mean, of course, Oh!!! My!!! God!!! And who says 110 in the shade is a more tolerable climate? I mean, really. Yesterday, Michael and I feasted at the table of our dear friends, Paula and Ken, their son and Ken’s sister. Before we ate, Paula passed around this lovely prose, written by Rev. Max Coots, and each of us read a few lines before passing it to the next person. For children who are our second planting, and though they grow like weeds and the wind too soon blows them away, may they forgive us our cultivation and fondly remember where their roots are. And finally, for those friends now gone, like gardens past that have been harvested, but who fed us in their times that we might have life thereafter. If you are a subscriber to this blog, you just received a “new post” notification about a Gallery West art and photography exhibition, but will notice the date was back in 2009. I just discovered that a few of my posts were set to “private,” meaning they weren’t posted to the general public. This wasn’t intentional, so I turned off private and allowed it to post to the public—which meant you got a notice that it’s a new post. Let’s just say it’s an old post that wasn’t published before—so it’s new to you, but old in chronological age. Enjoy it anyway! 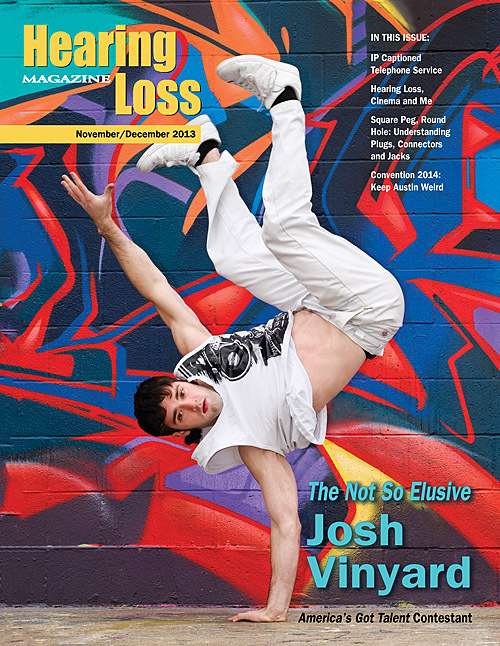 Dancer Josh “Elusive” Vinyard is our cover feature for the November/December 2013 issue of Hearing Loss Magazine, published bimonthly by the Hearing Loss Association of America. After seeing Josh on America’s Got Talent, I told HLM editor Barbara Kelley about him and then got the ball rolling to contact him. I was excited to learn that he lives in Austin, less than a two-hour drive from my family’s house in San Antonio! Very special thanks to photographer Brian K. Loflin for assisting with the photo shoot of Josh all around Austin, as well as the images he shot for the feature. Brian was my boss many years ago and has long been my photography mentor. 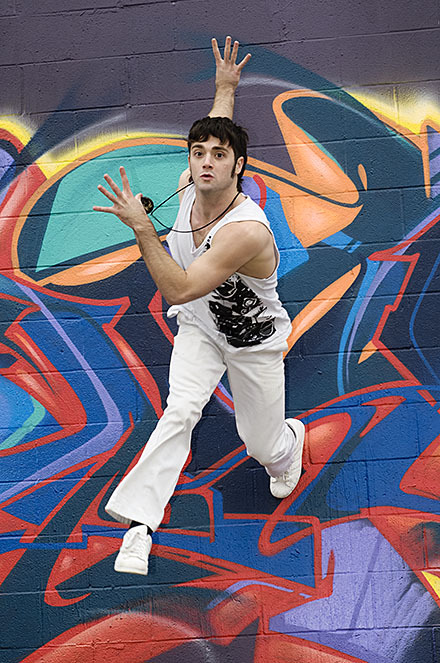 Austin is full of very colorful, graffiti-covered walls that made for a perfect backdrop for some of our shots. You can find Brian’s work at www.loflin-images.com. Visit his natural science photography blog, full of informative how-to photography articles, here: http://bkloflin.wordpress.com/. Thanks also to Josh’s friend, Peter Tsai, for the photographs he contributed to the feature. Visit Peter’s website at http://www.petertsaiphotography.com/blog/. 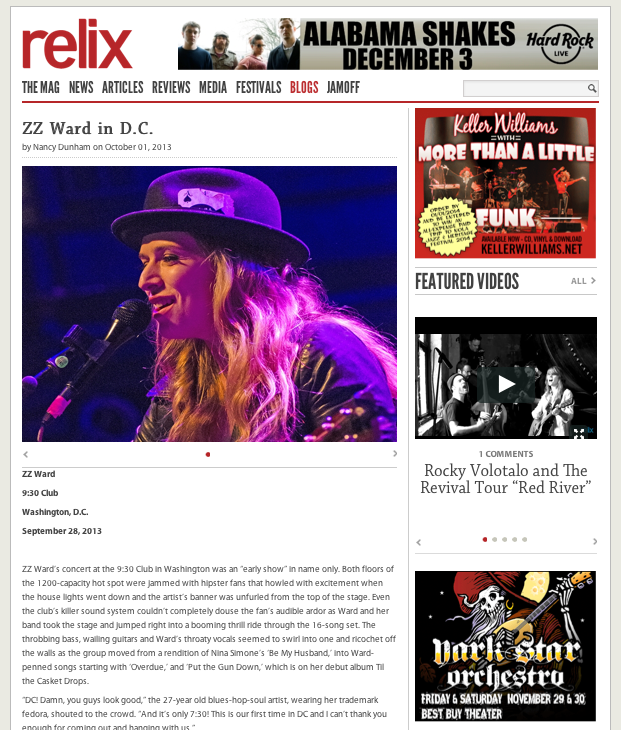 Visit Josh Vinyard’s website here. Josh is unlike other subjects I have photographed for Hearing Loss Magazine. All of the other people we have featured have faced their hearing loss and availed themselves of the amazing technology. Josh has avoided it, and I don’t think he really knows what it could do for him. His personal choice is to not wear hearing aids, despite his mother’s pressure to do so when he was younger. If he were armed with more knowledge about the products available to athletes, I think he might possibly consider it in the future. What do you think? Tell me about your hearing loss. I honestly don’t know many of the details of my hearing loss from when I was younger. I was born with holes in both of my eardrums. I have had four surgeries on my left ear and one on my right ear. Thankfully, having surgery to repair the hole in my right eardrum worked. The next two surgeries were on my left ear. The last surgery was to remove a cholesteatoma. [A cholesteatoma is an abnormal skin growth in the middle ear behind the eardrum. It is usually caused by repeated infection that causes an ingrowth of the skin of the eardrum. Hearing loss, dizziness, and facial muscle paralysis are rare but can result from continued cholesteatoma growth.] You would think I would take the time to learn about it now that I’m older, but it has affected me so much in my younger life and I suppose I just prefer to leave it behind me. Did you have any issues with your hearing loss when you were younger and in school? I wish I would have had more help in school. My mother pressured me to wear a hearing aid but I refused. I thought it would further alienate me from other kids and decrease my chances for making any friends. The truth was, I was already a social outcast because I could barely hear since the time I was born. Growing up, I had a hard time hearing people so I didn’t understand them most of the time. My solution was to stop trying to listen and play in my own imagination. I kept to myself and daydreamed all day long. I essentially committed social suicide without having a clue I was doing it. I gave the appearance of a loner, so kids labeled me as a weirdo and, presto, no friends! The teachers accused me of not paying attention in class and, presto, angry teachers! Granted, I wasn’t paying attention, but I never understood what they were talking about every time I did try listening. I refused to accept any hearing aids. School is not a fun place when you think the teachers and students are against you. And when you’re young, you blame yourself. Were you teased in school because of your hearing loss? I’m sure I was, but there are no specific times that I can remember. I never talked about my hearing loss when I was younger. I don’t want to say I was hiding it, but I never felt the need to express it with others. It was my personal business. Had you ever considered wearing a hearing aid? Do you think you’re missing out on things? I had not considered wearing hearing aids. As I said, I refused when my mother tried to get me to. The reason is because I did not want to be further segregated from the other kids. I don’t have the desire to wear one now because growing up, my hearing loss affected my life (for the better, I think) and I have discovered a lot of ways not to necessarily overcome it, but to handle it. I feel like I would be leaving a part of me behind in a sense. As an athlete, I don’t think I could constantly wear one. When I’m working on a show, movie, or in a competition, I need to hear, but I am performing and moving around a lot. I’ve seen the video of you breakdancing when you received your high school diploma. Was this spontaneous? How do you communicate without the help of technology? I read a lot of body language and facial expressions. This practice always gives me clues to the context of the discussion and then I fill in the gaps of what I did not hear. I love that I have learned to do it this way, though. I probably don’t hear everything but body language gives me an insight to what they really want to say versus what they are actually saying. How do people react when they learn you have a hearing loss? How does your hearing loss affect your life now, including dancing? Nothing that is really different, honestly. I ask people to repeat themselves a lot, and will offer them my explanation if I have to ask them repeatedly. I still rely on other resources for understanding people other than just hearing. My resources include body language, tone of their voice, reading their facial expression, the syllables of each word they use and lastly, the context of the discussion to weave everything together. As for dancing, it teaches me to rely on intuitively feeling the music versus counting beats. What would you want hearing people to know about your hearing loss in order to be more sensitive and accommodating? No special treatment needed. Just be understanding of when I ask you to repeat yourself or to speak a little louder. Just don’t try to talk in my bad ear! If someone were to encourage you to get your hearing evaluated to see if there is any kind of technology that would help you hear better, or understand conversation better, would you give it a try for your day-to-day life outside of dancing? Needless to say, I was pretty hard on myself. My dancing is the offspring of my pain, but, ironically. It has practically given me everything I have now. Pain plus dancing have made me into who I am today—a person whom I love and believe in. Does your family support your career choice? I have an awesome, amazing and loving family, and I love them all so much. I am the youngest and have an older brother and sister. We all enjoy our time together. It’s a rare thing that I have and I am so lucky. My family had never really supported my dancing and stunts, but they never discouraged it either. When it comes down to it, their attitude helped a lot. People have big dreams and a lot of them fall flat on their face. They thought there was a chance I might fail trying, but they weren’t going to discourage me from trying. When the America’s Got Talent opportunity arose, it was one of those events where they knew that anything was possible and I could achieve anything. Not that they didn’t think I had a lack of talent to do it, but just because they know how hard the world is. They fully support me now. What is your training ritual? I try to practice for a few hours every day. Or at least, at the bare minimum, one hour. Sometimes I will practice for six straight hours, then have a lengthy stretching session, followed by working out, then do some cardiovascular training such as running. It wasn’t until later that I learned the importance of recovery. I might then massage my body with a foam roller followed by an Epsom salt bath. My complete regimen averages about 20-30 hours a week. I have a background in gymnastics and martial arts that I pull from for working out. Around age 20, I studied anatomy and physiology enough to begin to understand really how working out worked. 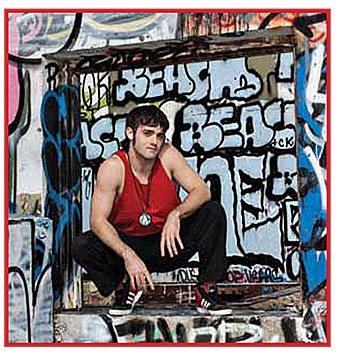 That’s when I began to design my own workouts and training routines specifically geared toward Bboying. “Bboying” stands for Break Boy. Breakers originally used this semi-acronym before the term breakdancing was popularly used. Using the Bboying is to use it as a verb, to breakdance. To call someone “Bboy” before their name is an adjective, to define them as a breaker. I do workouts and exercises that I still have not seen other people do. What are some of the daily habits and disciplines required to become a professional dancer? You have to work hard and push yourself. The more you sweat, the less you cry when things don’t work out. Dancing is a special field. You can’t just physically exert yourself. You have to exercise tremendous imagination and emotions. One of the hardest things to do is to simply allow yourself to relax, especially after an injury. A dancer should have had a lot of training in various physical endeavors such as stunt classes, martial arts, etc. 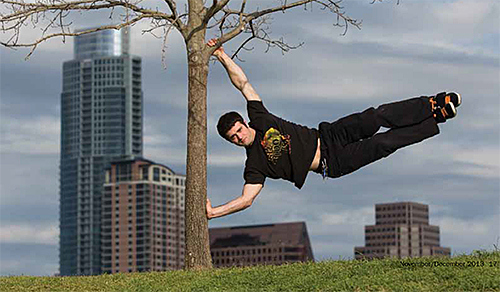 How does martial arts and stunt training help with dancing? I do a lot of random things—all physical—that all come together and help form me either directly or indirectly as an athlete and performer. What was your first paying gig or contest and how did it go? Do you have a “day job” or are you focusing solely on making a career out of your passion for dance? As of now, I am a full-time entertainer for dancing and stunts. Dancing has always been fun and it is my “crutch” and it will probably continue to be. As for a choice of career though, I am pursuing the stunt realm. Which dancers inspired you when started dancing? Who are your favorite dancers in this genre? I never really looked up to other dancers when I was learning. In my mid-teens, though, I was heavily inspired by Bboy Physicx. (He is a Bboy from Korea). Later I tried to learn from entertainers of all types. I loved to watch Bboy Cloud. His real name is Daniel Campos but his dance name is Cloud. Michael Jackson, James Brown and others have also influenced my work. Cloud and Physicx will without a doubt always be some of my favorite dancers in this genre. What is it about Hip-Hop dance that makes it Hip-Hop? This is where it begins to get weird unless you already understand it. Breaking is a form of dance that incorporates any movement the individual desires to use. The term breaking came about because Bboys would always dance to the breaks of a song. Breaking is a core part of hiphop. Hip-hop’s roots are in the Bronx and its fundamentals were graffiti, DJs, MCs (rappers) and Bboys. It is a raw art form. I say this because there is hardly any money, fame, or materialistic values involved in this art—the people who are a part of it are in it just to express themselves. It’s a creative outlet and it is fun. When you aren’t misguided for the wrong values, all that is left is you. And you feel compelled to express yourself. When I’m not practicing to gain something (money, etc.) I don’t have so many external influences. Everything becomes internalized, then everything emerges, allowing me to fully express myself. It’s a hard thing to express. What is the best way to learn Hip-Hop dance? How did you learn it? The best way to learn is by being a part of the Bboy culture. Go to where dancers are practicing, and join them, even if you don’t know anything. I learned breaking through online tutorials, took classes for a couple of months, and attended workshops when they were available. Above all, I practiced with my community and learned a lot from them. I don’t want to say I have made unique moves as my own, but the way I do them are unique. Do you try to push yourself in new directions with each new piece? I do try to make my dances more elaborate and indulge in other styles. One of my favorite things about breaking is that it isn’t one-sided. Breaking is everything and anything you can take from it. You can incorporate martial art moves, other styles of dancing—even different exercises like swimming. I saw a guy who acted like he was swimming on the floor and it looked fantastic, so I use them all. One thing I usually do not do is choreograph. The beauty and all the appreciation I find for Bboying lies within the ability to improvise. Each song is different, giving you different feelings, different tempos. Every venue is different. Every crowd is different. To adapt and be able to connect with them all is poetry in motion to me! Have you entered a lot of dance competitions? I have entered a lot of competitions. I entered one in Arizona when I was 18. I flew out, not exactly knowing where I was going to stay, who would be there, how I would get around, or how I would do. My expectations were pretty low and my trip was not planned at all. I just wanted to get past the preliminaries, but I ended up winning it. Talk about a surprise! Then there was the trip I took to Dallas for my 16th birthday. I had just enough money for a one-way bus ticket. I was relying on my ability to win to get the money to get back home. I lost the first round. I borrowed money from everyone to scrape together a bus ticket. Talk about disappointment! How did you decide to audition for America’s Got Talent (AGT)? I was extremely reluctant to audition. I didn’t think I would make it past their auditions, but after a good friend pressed me enough to actually try it out, I reluctantly did. I just walked into the building and said “I’m here to audition.” I ended up making it to the quarterfinals. Out of the 75,000 people who auditioned for the show, I was a solo performer among the 48 groups they selected. I was a little surprised, to say the least. First stop was Austin, then Las Vegas, then to Newark, New Jersey. When you made the first cut, how did you prepare for the next step? Once I was told I was going to Vegas, I was really surprised. This meant that I passed the audition round. To go beyond Vegas meant I would be among the quarter-finalists. So I basically made it to round three. I just improvised during the auditions, so I figured this time I’ll actually put together something good. I practiced, rehearsed and executed a very well done routine in the Vegas round. Unfortunately, it was edited around and music dubbed over instead of my actual performance. What was the AGT experience like? Were there any pressures? How did you adjust—or not adjust? AGT was a horrifying process, but I was able to fall back on my old nature of being able to internalize and keep myself calm. It kept me and my performances protected. I have to say I adapted as well to the pressures as any survivor possibly could. Being on a live national television show is the scariest thing I have ever done, and I’m not sure if it will ever be topped! What kinds of things did AGT do to accommodate your hearing loss? Nothing. They actually didn’t even know about my hearing loss until the last round of the show. They were actually upset that I didn’t tell them sooner. The judges were Howard Stern, Sharon Osbourne, and Howie Mandel. I never got one-on-one time with any of them so I don’t know what they were really like. They critiqued my performance but didn’t offer me constructive criticism. How has coming so far in AGT helped your career and visibility of your work? Honestly, I can’t really make any firm claim that AGT has landed me any work. It is a good credential that assesses my value with clients, but it has not directly helped my career. What advice do you have for a dancer who wants to become established in the arts? Is it important to have an agent? I don’t believe it’s as important as people think. If an agency finds you just one audition, then they are beneficial and worth it. But too many people rely on agents. As in a lot of careers, people have to go out, hustle, and be able to find their own work. I have never had representation. My advice to others: Have fun and enjoy it. That’s the only way you’ll actually be able to get good at it. Were you born in Austin? I was not born in Austin, but I have lived here since I was two or three years old. I have no memories of before Austin, so I consider myself an Austinite. There is not much work for dancing gigs in Austin as of yet, but Texas just increased their tax incentives for filmmakers so that might bring in more work. I focus on film, corporate and marketing gigs in Austin. Tell me about your commercials. You can see most of these projects on my website (www.joshvinyard.com). I choreographed the routines myself. Commercials pay handsomely, not for the actual day rate but for the residuals. I always have a lot of fun making videos and love to experiment and find new ways to interact with the camera, the angles, lighting and how it can all influence and alter the performance. You recently met some agents in California. How did that go? I met with a lot of agencies but they all wanted me to live in LA. I decided my desire to work didn’t override my desire to live in LA. I am not currently represented by any agencies. I saw in your IMDB.com profile that you have been a stuntman in several movies, including an upcoming Spiderman movie. How did that come about? Earlier this year, I went to Los Angeles to pursue dancing and stunt work. After three weeks, I came back to Austin, heartbroken and absolutely broke. I spent the next few days thinking about giving everything up and wallowing in self-pity. I then picked myself back up, and told myself, Yes, I can do it and I met stunt coordinator Andy Armstrong less than 24 hours later. He proceeded to put me to work on The Amazing Spider-Man 2 for two months as a stunt performer. I can guarantee that if I had kept my same doubtful mindset, it would not have ever happened. You attended Austin Community College. What did you study? I was studying for a bachelor’s degree in nutrition. I got halfway there before I dropped out of school to work with Andy Armstrong on the Spider-Man 2 movie, which debuts in 2014. Although I earned enough credit hours for an associate’s degree. It will be some time before I get back to school, though, because I have a career to think about now. What are some of the current projects you are working on? Future projects? I am working on film projects, both for dance and stunts. My dream project would be something that incorporates all aspects of entertainment—music, dance, acrobatics, special effects—just everything in general into something extremely dynamic. I have crazy ideas like being completely on fire while doing power moves, and things like that but nothing concrete is planned right now. I know one thing for sure: It is so critical to always believe in yourself. HLAA Convention 2014 will be held in Josh’s hometown—Austin, Texas. I think I might be able to convince him to check out the Exhibit Hall and learn about the amazing technology now available to atheletes like him. And who knows? There might be a Josh Vinyard sighting. Just look for the guy dancing off the wall! Freelance graphic designer and photographer Cindy Dyer serves as designer and photographer for Hearing Loss Magazine. She experienced sudden hearing loss in her right ear in 1993 and had a cholesteatoma removed in same ear in 2003. She wears a hearing aid in her left ear. Cindy can be reached at dyerdesign@aol.com. 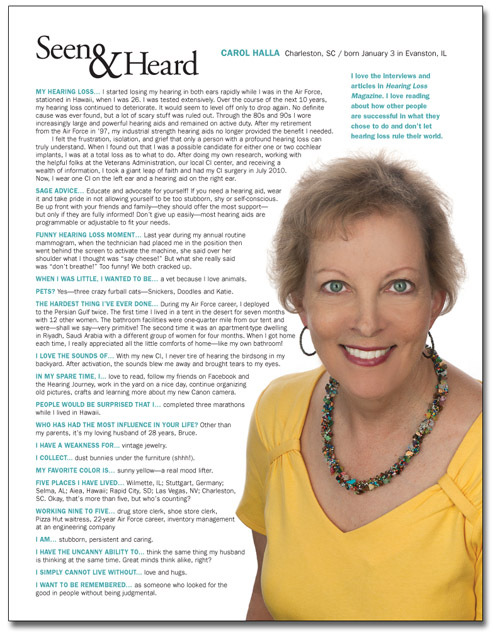 Carol Halla is our Seen & Heard profile in the November/December 2013 issue of Hearing Loss Magazine, published bimonthly by the Hearing Loss Association of America. I photographed Carol at HLAA’s Convention 2012 in Providence, R.I.
MY HEARING LOSS…I started losing my hearing in both ears rapidly while I was in the Air Force, stationed in Hawaii, when I was 26. I was tested extensively. Over the course of the next 10 years, my hearing loss continued to deteriorate. It would seem to level off only to drop again. No definite cause was ever found, but a lot of scary stuff was ruled out. Through the 80s and 90s I wore increasingly large and powerful hearing aids and remained on active duty. After my retirement from the Air Force in ’97, my industrial strength hearing aids no longer provided the benefit I needed. I felt the frustration, isolation, and grief that only a person with a profound hearing loss can truly understand. When I found out that I was a possible candidate for either one or two cochlear implants, I was at a total loss as to what to do. After doing my own research, working with the helpful folks at the Veterans Administration, our local CI center, and receiving a wealth of information, I took a giant leap of faith and had my CI surgery in July 2010. Now, I wear one CI on the left ear and a hearing aid on the right ear. SAGE ADVICE…Educate and advocate for yourself! If you need a hearing aid, wear it and take pride in not allowing yourself to be too stubborn, shy or self-conscious. Be up front with your friends and family—they should offer the most support—but only if they are fully informed! Don’t give up easily—most hearing aids are programmable or adjustable to fit your needs. FUNNY HEARING LOSS MOMENT…Last year during my annual routine mammogram, when the technician had placed me in the position then went behind the screen to activate the machine, she said over her shoulder what I thought was “say cheese!” But what she really said was “don’t breathe!” Too funny! We both cracked up. WHEN I WAS LITTLE, I WANTED TO BE…a vet because I love animals. PETS? Yes—three crazy furball cats—Snickers, Doodles and Katie. THE HARDEST THING I’VE EVER DONE…During my Air Force career, I deployed to the Persian Gulf twice. The first time I lived in a tent in the desert for seven months with 2 other women. The bathroom facilities were one-quarter mile from our tent and were—shall we say—very primitive! The second time it was an apartment-type dwelling in Riyadh, Saudi Arabia with a different group of women for four months. When I got home each time, I really appreciated all the little comforts of home—like my own bathroom! I LOVE THE SOUNDS OF…With my new CI, I never tire of hearing the birdsong in my backyard. After activation, the sounds blew me away and brought tears to my eyes. IN MY SPARE TIME, I…love to read, follow my friends on Facebook and the Hearing Journey, work in the yard on a nice day, continue organizing old pictures, crafts and learning more about my new Canon camera. PEOPLE WOULD BE SURPRISED THAT I…completed three marathons while I lived in Hawaii. WHO HAS HAD THE MOST INFLUENCE IN YOUR LIFE? Other than my parents, it’s my loving husband of 28 years, Bruce. I HAVE A WEAKNESS FOR…vintage jewelry. I COLLECT…dust bunnies under the furniture (shhh!). MY FAVORITE COLOR IS…sunny yellow—a real mood lifter. FIVE PLACES I HAVE LIVED…Wilmette, IL; Stuttgart, Germany; Selma, AL; Aiea, Hawaii; Rapid City, SD; Las Vegas, NV; Charleston, SC. Okay, that’s more than five, but who’s counting? I AM… stubborn, persistent and caring. I HAVE THE UNCANNY ABILITY TO…think the same thing my husband is thinking at the same time. Great minds think alike, right? I SIMPLY CANNOT LIVE WITHOUT…love and hugs. I WANT TO BE REMEMBERED…as someone who looked for the good in people without being judgmental.